However, some things never change, and India's kabaddi supremacy is certainly one of these. Anup Kumar's side, considered overwhelming favourites to lift their third World Cup, did so in emphatic fashion. However, doing so against an Iran side that played the match of their lifetimes has an astonishing feel about it. Iran's dreams of lifting their maiden World Cup were as much dependent on India having an off day as on their players playing out of their skin. The superior technique of the Indians meant that Iran's best foot forward may not have been enough. Despite facing such a daunting task, the Iranians did their bit and gave more than 100 percent, for which they deserve all the credit in the world. The final was touted to be a battle between India's raiders and Iran's defence, and in the first half there was only one winner. Iran's defenders weren't just bundling India's raiders to the ground, but they also gave them little chance to take anything away during their raids. Their defensive discipline suffocated Indian raiders, who tried doing something different only to fall deeper into Iran's trap. Moreover, it wasn't just the raiders who were having a bad day for India. 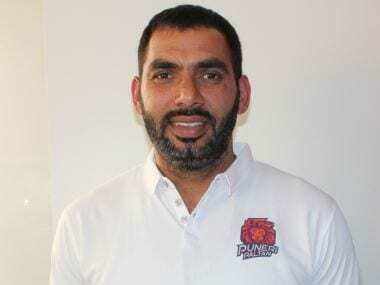 Vice-captain Manjeet Chhillar was having an evening to forget; fellow defenders Surjeet and Sandeep Narwal made uncharacteristic errors, and Iran had a 18-13 lead at the break. It was a dream scenario for Iran. Their players were at the peak of their powers and India's best were struggling to fire. The dream was on and the hosts were feeling the heat. However, by the time Iran returned to their dugout, they had finished runners-up to India in yet another Kabaddi World Cup. They did little wrong after the break, but a certain Ajay Thakur, one of India's all-time great raiders, had the half of his career. A two-point raid from Thakur early in the second half provided the spark India were looking for, and that was enough for the hosts to stamp their class on the occasion. What was more special about the 30-year-old raider was that he was doing it all alone at the start of the second half. Captain Anup Kumar wasn't having the best of the evenings, while substitute Rahul Chuadhari also didn't make the desired impact. The defence remained shaky. It was only after Ajay's heroics, which got the crowd behind the home side, that few of India's players picked up. Nitin Tomar, mostly used as a substitute by India in the tournament, came in and played an able support cast to Thakur, scoring six raid points in the process. A super raid that came at a crucial time in the second half dealt a blow to Iran's defensive organisation, allowing Thakur to do further damage. In defence, India found a hero in Surjeet. After a uncertain first half, the right cover defender made three brilliant blocks to trap Iran's raiders. His presence in defence played on the minds of the Iranian raiders after that, thus nullifying their threat. India were inspired by Ajay Thakur's class, and useful contributions from Tomar and Surjeet in the second half saw Iran off. The hosts were not at their best as a unit on Saturday, but individual brilliance was enough to see them through. Captain Anup Kumar acknowledged Thakur's value. "Ajay changed the whole game. I feel it's because of him that we've won," Kumar said, highlighting the impact of Thakur's 12 raid points in the context of the game. Another stellar aspect of India's victory was the variety of options they had up their sleeve. Balwan Singh had the liberty of taking off players like Manjeet Chhillar and Sandeep Narwal and replace them with Tomar and Mohit Chhillar. The latter, who came on as a substitute with just two men on the field, made a crucial super tackle to prevent Iran building a bigger lead before half-time. Then there was Rahul Chaudhari, who came in to replace the indifferent Pardeep. India had this liberty thanks to the strength and depth in their squad, something Iran just didn't have. When they were in trouble in the final 10 minutes, they didn't have that kind of options to choose from and the pressure grew on key players like Meraj Sheykh to deliver. "At half time, we changed a few players. We were confident about the changes as all our players are equally good and they always contribute when given a chance," Kumar said at the post-match conference, when asked about India's use of their bench. India were way off their best against Iran, but still managed to beat them. In fact, one may wonder if the hosts were ever at their peak during this tournament, as they played either in matches that were too easy for a team of their quality or just didn't go full throttle. But despite not being at their best, India ended the tournament as the best in the world. The hosts scored 224 raid points, 69 more than second best. They also led tackle point charts with 102, 19 better than Iran's 83, without actually hitting their peak. Iran must be wondering what they must do to get one over this Indian side. For now, they have to live with the fact that India are miles ahead of the rest of the world in the sport, and even their best performance may not help them beat India. This World Cup win was just another proof of India's supremacy in kabaddi. Iran and the rest of the could do with learning something from this, but at least for the time being, it's a reality that they must accept.